Chateau Pouget which is one of the more obscure Classified growths in the Medoc. Chateau Pouget was created in 1748 when François Antoine Pouget inherited the vineyards. The estate was named as you can guess, after the Pouget family. In 1771, the daughter of François Antoine Pouget married Pierre Antoine de Chavailles. During the French Revolution, part of Chateau Pouget was annexed into Chateau Kirwan. Chateau Pouget remained with the de Chavailles family for over 150 years! Today, Pouget is owned by the Guillemet family, who took over the vineyard in 1906. The Guillemet family also count Chateau Boyd Cantenac among their holdings in the Margaux appellation. Lucien Guillemet is currently managing things at Chateau Pouget along with their sister vineyard, Chateau Boyd Cantenac. Chateau Pouget is one of the very few, 1855 Classified Medoc Bordeaux estates without a true chateau. They are located on a small, side street, close to the train tracks, not far from the tiny village of Margaux. he wine of Pouget is made in what looks like an old converted house. Or perhaps, it’s a cellar that was partially turned into what seems to resemble an old converted house. It’s hard to say. 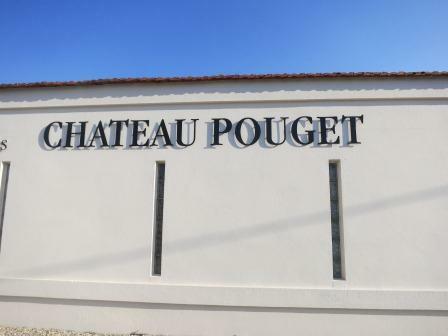 Interestingly, Chateau Pouget is one of the few 1855 Classified Growths not selling their wine on the Place de Bordeaux, as they prefer selling all their wine to one negociant, the Cordier group. The 17 hectare, Left Bank vineyard of Chateau Pouget is planted to 60% Cabernet Sauvignon, 30% Merlot and 10% Cabernet Franc. The vineyard has a terroir of sand and gravel soils in the Margaux appellation. On average, the vines are close to 40 years old. The vines are planted to a density of 10,000 vines per hectare. The vineyards are farmed using 100% organic farming techniques. Chateau Pouget earned their organic certification, starting with the 2017 vintage. To produce the wine of Chateau Pouget, vinification takes place in temperature controlled, stainless steel vats. Malolactic fermentation takes place in a combination of French oak barrels and vats. The wine of Chateau Pouget is aged in 30% to 50% new French oak barrels for between 12 and 18 months. The percentage of new oak used in the aging varies due to the quality and character of the vintage. On average, 5,000 cases of Pouget are produced each vintage. There is a second wine, Antoine Pouget, which was previously sold under the name of La Tour Massac. Chateau Pouget can be enjoyed on the young side with decanting. Young vintages can be decanted for an average of 1-2 hours, give or take. This allows the wine to soften and open its perfume. Older vintages might need very little decanting, just enough to remove the sediment. Chateau Pouget is best served at 15.5 degrees Celsius, 60 degrees Fahrenheit. The cool, almost cellar temperature gives the wine more freshness and lift. Chateau Pouget is best served with all types of classic meat dishes, veal, pork, beef, lamb, duck, game, roast chicken, roasted, braised and grilled dishes. Pouget is a perfect match with Asian dishes, hearty fish courses like tuna, mushrooms and pasta as well as cheese. This medium-bodied wine is centered around its earthy, floral and bright, red berry character. This should drink well with just a few years of age. A fresh, crisp, medium-bodied wine with a plummy character and an emphasis on bright, red fruits, earth and tobacco. From a blend of 66% Cabernet Sauvignon, 25% Merlot and 9% Cabernet Franc, the wine is medium bodied, fresh and round, with a floral and blackberry character. This drinks well young, especially for a 2010. Uncomplicated, easy to drink wine, without faults or excitement that already drinks well.